had a chance to touch. Editors Notes on “Extinction”: Whenever dinosaurs and asteroids are combined, I promise you’ll have a captive audience among the young ones, but also among the older generation, which I can testify personally. 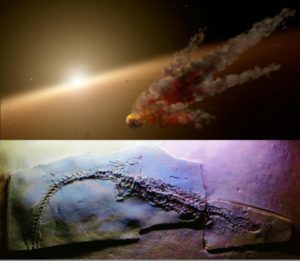 The split image of an artist conception of an asteroid collision leading planet formation near star NGC 2547-ID8 is also reminiscent of the meteor impact in the Yucatán Peninsula that contributed to the dinosaur extinction. In the lower panel, the fossilized remains of the mesosaurus are shown (distinct from mosasaurs).